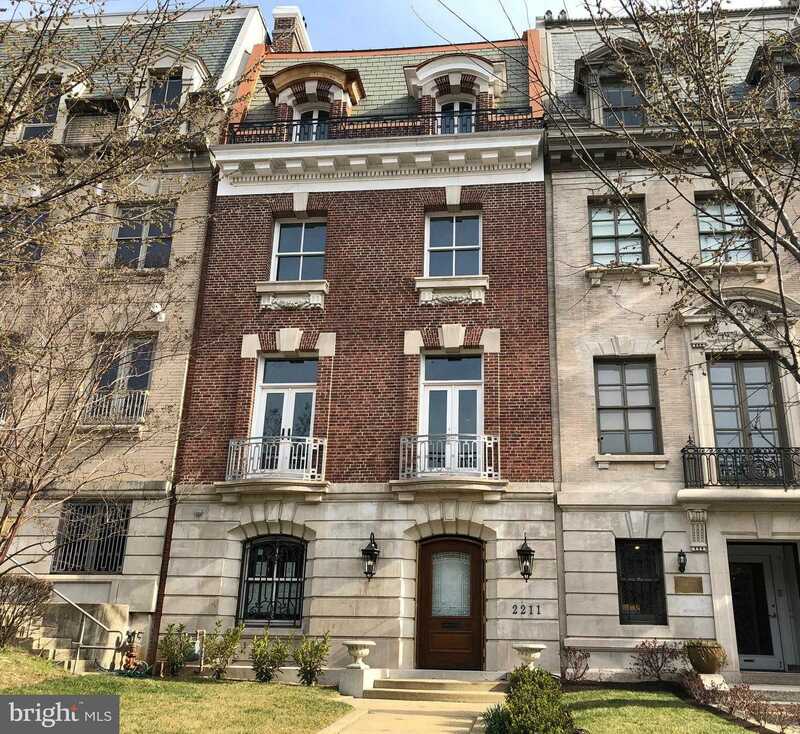 Courtesy of Guy R d’Amecourt, Summit Commercial Real Estate, LLC..
2211 Massachusetts Avenue, NW is a 9,400 sf six-story townhouse, ideally located on historic Embassy Row. Formerly part of the Greek Embassy, 2211 Massachusetts Ave, NW has undergone a full renovation, including new elevator, and is being delivered, in a warm lit shell ready for final tenant finish. The property is ideal for an embassy chancery or residence, as well as a high-end residential home. Certain modifications are still possible to accommodate different uses. Located on Embassy Row, just three blocks west of Dupont Circle, it is on the line that separates Dupont Circle and Sheridan-Kalorama and on the edge of the downtown Central Business District (CBD) just 3 blocks from the Dupont Circle Red line Metrorail stop. It is also served by several Metro buses. Dupont Circle is one of DC’s most diverse and celebrated neighborhoods with boutique shops and cozy restaurants. The area boasts extremely walkable blocks with easy access to housing, offices, and the Metro. Dupont Circle features more than 150 restaurants, 80 shops and countless services that range from local craft stores and international foods to quick service restaurants and fine dining ~ and everything in between. Embassy Row is the informal name given to the section of Massachusetts Avenue NW between Scott Circle and the north side of the United States Naval Observatory. This area is highly concentrated with embassies, and other diplomatic representations. Embassy Row is protected in the Massachusetts Avenue Historic District, which was established in 1974 following the controversy over the destruction of historic townhouses on Massachusetts Ave. Dupont Circle also has a high amount of historical appeal and architectural diversity as many of the buildings were constructed in the late 1800’s and early 1900’s. The Dupont Circle neighborhood is listed on the National Register of Historic Places and is home to numerous embassies, many of which are located in historic residences. More than 70 embassies are located in and around Embassy Row. Sheridan-Kalorama is one of, if not the most prestigious residential neighborhoods in DC. The Sheridan-Kalorama neighborhood also includes many diplomatic residences. Its southern border includes much of Embassy Row on Massachusetts Avenue. Please, send me more information on this property: MLS# DCDC403172 – $8,500,000 – 2211 Massachusetts Avenue Nw, Washington, DC 20008. I would like to schedule a showing appointment for this property: MLS# DCDC403172 – $8,500,000 – 2211 Massachusetts Avenue Nw, Washington, DC 20008.